In ministering to Vietnamese do Westerners come across as rude, inconsiderate, stingy? Unfortunately that could be the perception at times based on differences in cultural values and practices. The answer to ministry across such a culture clash is to submit our self for the sake of the Gospel so that by all possible means we might save some! 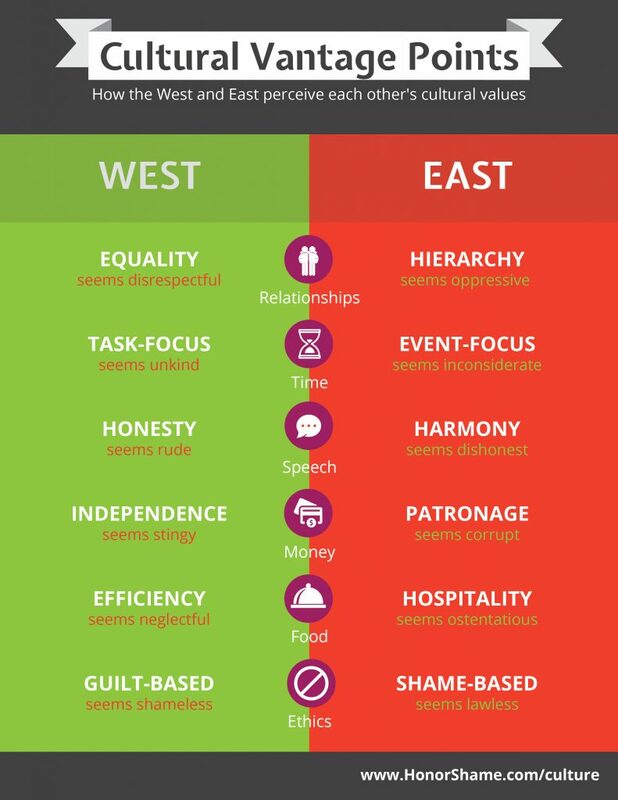 (1 Cor 9:21-23) The people at HonorShame.com published the following infographic detailing 6 key areas and the primary cultural value for West/East in that area. The primary value or stance from the given area is the bold white text while the perception by the other culture of that stance is in the smaller text underneath. Read the full posting from HonorShame here.